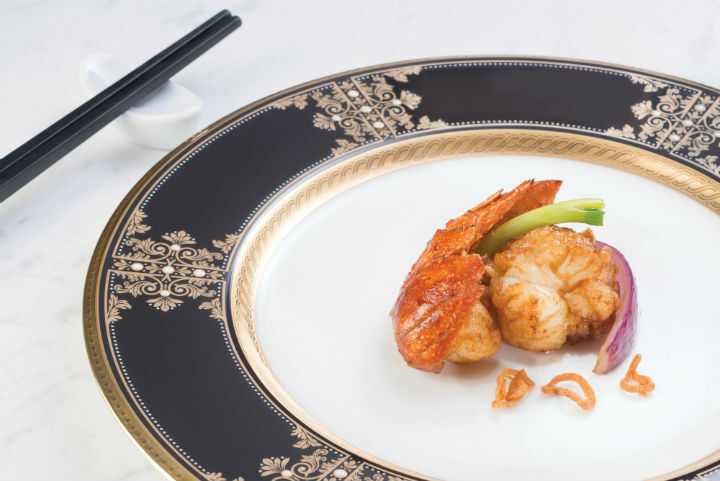 Despite his classic Cantonese cooking background, chef Kwong from The Langham Hong Kong believes innovation is a necessary skill for every chef. T’ang Court in the Langham Hotel Hong Kong was awarded with three Michelin stars in the 2016 edition of the Michelin Guide Hong Kong Macau, making it only the world’s third Chinese restaurant to be bestowed with the red book’s top honours. What’s more, the restaurant has managed to retain this outstanding achievement for the second year running. Though winning a Michelin star - let alone three - is a coveted accolade most chefs can only dream of, Chef Kwong doesn’t let it go to his head. “The duty of every chef is to dedicate yourself to serving the best food possible. My team and I will continue to bring Cantonese cuisine to its highest level, maintaining the standard of excellence we’ve come to be known for,” he says. “That said, the awarding of the third Michelin star to T’ang Court will help to elevate the position of Chinese cuisine - particularly traditional Cantonese cooking - on the world stage. We will increase our training opportunities to let young chefs who are interested in specialising in Cantonese cooking immerse themselves in the culture and inherit classical cooking skills. 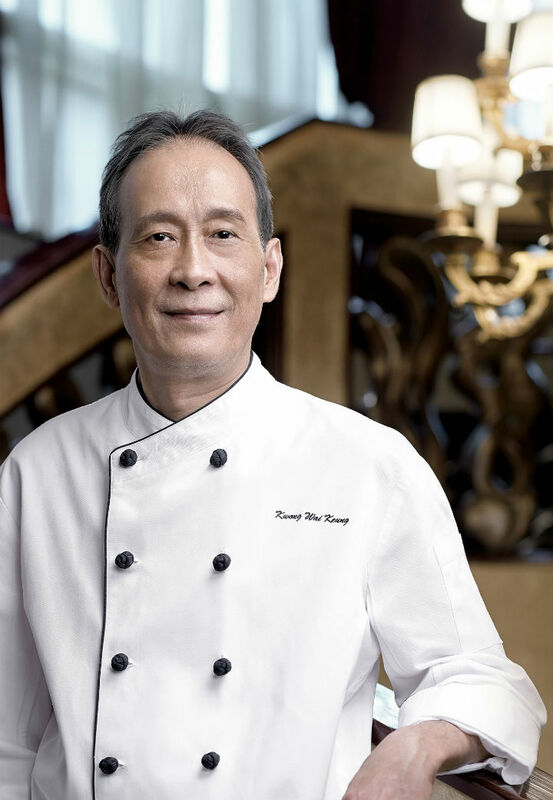 Despite his classic Cantonese cooking background, Chef Kwong believes that innovation is a necessary skill for every chef. In order to pique customers’ curiosity and to keep them coming back for more, chefs should spend a bit more thought on the entire process of creation, from the tracing the origins of ingredients to the marketing value of a menu. I started working for a hotel in Central at the age of 14, just after completing primary school. In my 46 years in the profession, I slowly worked my way up from a kitchen assistant to the position of Executive Chef of Chinese Cuisine at the Langham Hotel Hong Kong. I took up my first job to make ends meet, but I quickly discovered my passion for cooking. I still remember working more than 12 hours a day in my initial years, and had to learn everything from scratch, from handling a wok, to washing and preparing ingredients, chopping, frying, roasting and various other kitchen sections - I’ve been through them all. At the time, head chefs were not always willing to show you how to do things, you had to rely on your own observations and trials to learn on your own. Now that I am executive chef, it’s even more critical not to take short cuts. In this role, I have to constantly source for new ingredients to create new dishes, ensure the quality of all the dishes we send out are at a consistent high standard, and on the management front, I have to lead an entire kitchen team and make sure they always have opportunities to learn and to improve themselves. Could you share with us your culinary philosophy and personal cooking style? “Seasonality is everything”, this is a key philosophy in Cantonese cuisine. Using ingredients that are in season are the best way to get the most flavour out of them. As such, I will update our monthly specials on the Tang Court menu every one to two months. I especially enjoy cooking with seafood - if you’ve got the freshest seafood, whichever way you choose to prepare it, you don’t have to overcomplicate things to bring out the best in them. To preserve the freshness of the seafood, you need to pay strict attention to the cooking times, temperatures - and this precision requires time and experience to master. Some of my favourite seafood to cook with are crabs and lobsters. A philosophy I’ve always held is to stay true to my professional cooking techniques. For instance, most people may think that fried rice is a simple task, but to really perfect it, you have pay attention to controlling the strength of the fire and the duration. I insist on perfecting every dish we send out, in order to maintain a consistent high standard, while retaining the essence of Cantonese cuisine to showcase the best of Cantonese cooking to the world. Stir-fried lobster; sauteed prawns and crab roe accompanied by golden fried pork and crab meat puffs; and the baked seafood rice in crab shell. 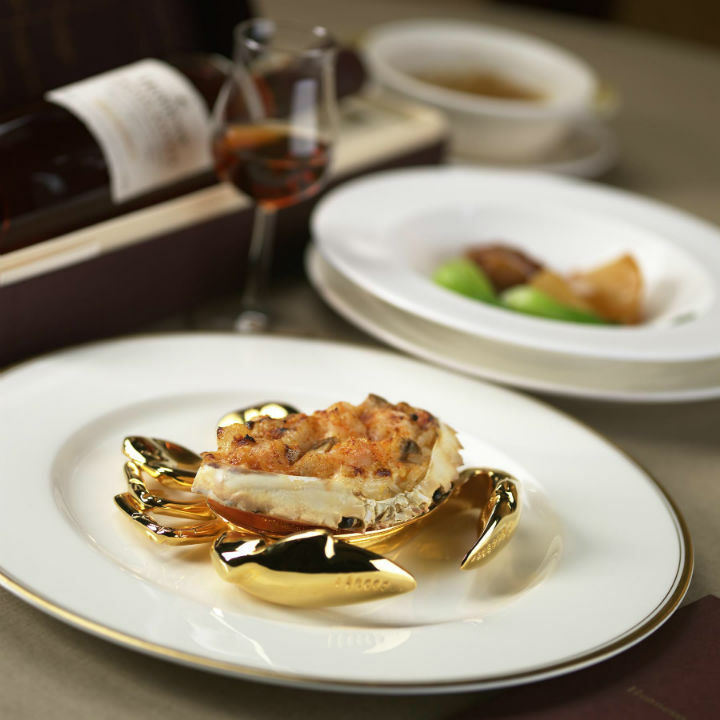 The lobster dish was a Gold Award winner in the Shrimp and Crab category of the Hong Kong Tourism Board’s 2002 Best Culinary Awards. I use three different types of onions in the dish: spring onions, red onions and shallots, which combine to highlight the freshness and sweet, tender texture of the lobster flesh. The feature of this dish is a local lobster, which grows in shallow waters. The low water pressure helps to keep the meat tender and rich in flavour. Its body is a bit smaller, and we tend to pick those that weigh around 100g, so the flavour is more dense than what you get from lobsters of a larger size. To get the most of out these dishes, we prepare them in a metal wok in order to achieve ‘wok hei’, a hallmark of Cantonese cooking. We fry the onions till they are golden brown, before adding the red onions and spring onions, along with the lobster, into the wok. We then stir-fry them with a splash of Shao Xing rice wine and plate with a generous sprinkle of dried onions. The aroma of the three different types of onions, along with the sweet, tender flesh of the lobster makes for an aromatic dish that you smell even before it is presented on the dinner table. Where do you get inspiration for your dishes from? I draw inspiration for most of my creations from my daily life, for instance, in the lead up to the 2002 Best Culinary Awards competition, I had a whiff of stinky tofu one day, which inspired me to create a dish that diners can smell before they see, and the result is the stir-fried lobster dish I described previously. I love visiting markets to discover new ingredients, especially open-air markets with rows of booths and little provision shops that sell traditional ingredients and condiments - you could say they are a quintessential Hong Kong experience, and a Chinese chef’s paradise. I enjoy the genuine interactions with stallholders, many of whom have become friends over my many years of patronage, so much so that they’ll often reserve their best products for me or even give me a ring whenever they’ve brought in interesting ingredients. What is your most memorable lesson learnt in the kitchen? Hardwork is the key to success. When I look back at my journey, I didn’t become the chef that I am today just because I love cooking - it was through plenty of dedication, persistence and practice that I eventually got my cooking skills to where it is today. I don’t know what advice I should give to chefs who are aiming for a Michelin star, but I often tell my team that you should treat your guests as your family. You musn’t be afraid of hard work, and you should put your heart into learning and experimentation. When I see my guests enjoying themselves at the dinner table, with big smiles on their faces. It also makes me proud when I see the chefs in my team, particularly those from a younger generation, slowly mature and improve under my guidance and shine in their own right. Last Dinners: Why Are These Top Restaurants Around The World Closing Down? We uncover why iconic restaurants in Singapore, Bangkok, Taiwan and Belgium have decided to call it a day. Wet markets are the beating heart of Hong Kong’s robust food culture. Three chefs walked us through their favourite haunts.